I had wanted to make a series out of this post, and so I finally got around to writing the second installment! Recently my Hubby wanted to splurge on me a little. 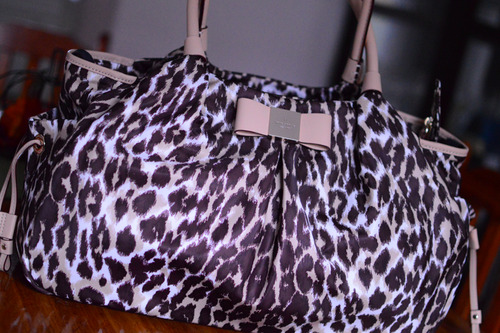 He knows my favorite designer is kate spade so we both went online and picked out this adorable, cheetah diaper bag. Reasons to have a nice diaper bag [that’s not a backpack]: Contrary to popular belief, you will still go to nice places once you have a baby. We go to church every Sunday, we’ve been to a broadway show, we go out to dinner with family, etc. Backpacks are awesome, and functional, and really great for when you’re running around with baby solo, doing errands… but for Sunday Mass? Evening dinner? Not so much. Splurge on a nice diaper bag, or even on a bigger [but still chic looking] purse that offers many compartments!